In March 2014, Manatee County Sheriff's deputies were called to a motel in Bradenton to investigate a possible robbery. When they arrived, they encountered the victim who informed them she had been robbed by Edwards and his friend, Rachel Simms. The officers located Edwards and Simms in a motel room and interviewed them. During the investigation, the officers discovered a car key for a vehicle parked outside. One of the officers had seen Edwards sitting in the driver's seat of the vehicle a couple of hours prior to the robbery call. As a result, the officers asked Edwards for consent to search the vehicle. Edwards notified the officers that he did not own the vehicle but instead had borrowed it. The officers then obtained consent from the owner of the vehicle, but the owner advised the officers that the key found in the motel room would only work in the vehicle's ignition. It would not open the vehicle because the vehicle was equipped with a combination lock. The owner gave the officers the combination to unlock the vehicle, but the evidence reflected that Edwards knew the combination as well. During the search of the vehicle, one of the officers located a gray canvas bag under the driver's seat. Inside that bag was a wallet that contained Edwards's identification card as well as a bail bond receipt bearing the name of "Joanne A. Simms." The robbery victim's identification card was also found in the canvas bag along with a few other items that contained no identifying information. The police report reflected that there was a smaller purple bag inside the canvas bag and inside that smaller bag was a plastic baggie containing rock cocaine. The officer who found the cocaine testified that there was indeed a purple bag inside the canvas bag despite the fact that there was no purple bag submitted into evidence at the sheriff's office. "While this case does present circumstances that could be interpreted as incriminating, those circumstances can also be construed as being consistent with . . . innocence." Edwards was arrested and charged with robbery with a firearm and possession of cocaine. At trial, Simms testified regarding the events leading up to and including the alleged robbery. However, her testimony revealed some inconsistencies regarding exactly when she had been inside the vehicle in question. She at first admitted going with Edwards and the victim to get cigarettes, but she subsequently denied being in the vehicle on the day of the alleged robbery. However, Edwards testified that on the relevant date, he, Simms, and the victim all got into the vehicle and went to a local convenience store to obtain cigarettes. He testified that Simms drove the vehicle there. He denied possessing the cocaine, and there was no evidence presented regarding ownership of the canvas bag or the purple bag within the canvas bag. There was also no fingerprint evidence submitted. Edwards moved for judgment of acquittal arguing that the vehicle had been jointly occupied and that the State had failed to present independent proof that Edwards had knowledge of the cocaine and the ability to maintain dominion or control over it. He proffered that it was possible that Simms or the victim placed the cocaine in the bag. His motion was denied. Ultimately, the jury acquitted Edwards of the armed robbery charge but found him guilty of the possession charge. He was sentenced to a suspended five-year prison sentence and placed on one year of community control followed by two years of probation. His license was also suspended, and a community service requirement was imposed. Why did the Florida Court Reverse the Drug Crime Conviction? We employ de novo review over the denial of a motion for judgment of acquittal. See Pagan v. State, 830 So. 2d 792, 803 (Fla. 2002). We will only reverse if the conviction is not supported by competent, substantial evidence. See id. Yet "[w]here, as here, the evidence of the defendant's guilt is entirely circumstantial, a conviction cannot be sustained unless the evidence is inconsistent with any reasonable hypothesis of innocence." Bennett v. State, 46 So. 3d 1181, 1183 (Fla. 2d DCA 2010) (citing State v. Law, 559 So. 2d 187, 188 (Fla. 1989)). What does the Prosecutor Need to Prove to establish Possession of Cocaine in a Drug Crimes Case? Here, Edwards was not found in physical possession of the cocaine and thus the State's case was predicated on constructive possession. The State was required to prove, beyond a reasonable doubt, that Edwards knew of the presence of the cocaine and had the ability to exercise dominion and control over it. Bennett, 46 So. 3d at 1184; Jackson v. State, 995 So. 2d 535, 539 (Fla. 2d DCA 2008). "The surrounding circumstances must support the inference of a 'conscious and substantial possession by the accused, as distinguished from a mere involuntary or superficial possession.' " Jackson, 995 So. 2d at 539 (quoting Reynolds v. State, 111 So. 285, 286 (Fla. 1926)). "Mere proximity to contraband, without more, is legally insufficient to prove possession." Id. (quoting Pena v. State, 465 So. 2d 1386, 1388 (Fla. 2d DCA 1985)). "As our case law has made clear, a defendant's knowledge and control of contraband may be inferred where there are incriminating circumstances beyond mere proximity from which a jury could infer those elements." The evidence failed to show that Edwards had knowledge of the presence of or had the ability to exercise dominion and control over the cocaine. Although he admitted borrowing the car, knew the combination to unlock it, and had been seen sitting in the driver's seat a couple of hours prior to the alleged robbery, he was not with the vehicle when the officers arrived. Further, there was evidence presented that Simms and the victim had been in the vehicle with Edwards that day and that Simms had actually driven the vehicle. 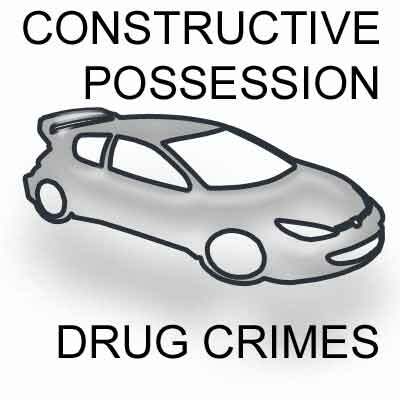 What happens in Drug Possession cases when the vehicle has multiple occupants? Where the area in which drugs are found is in joint, rather than exclusive possession, a defendant's "knowledge of the contraband's presence and the ability to control it will not be inferred from the ownership but must be established by independent proof." Jackson, 995 So. 2d at 539 (quoting Brown v. State, 428 So. 2d 250, 252 (Fla. 1983)). This can be done either "through 'evidence that the defendant had actual knowledge of the presence of the contraband or evidence of incriminating statements or circumstances, other than simple proximity to the contraband, from which the jury could infer the defendant's knowledge' of the contraband." Id. (quoting Wagner v. State, 950 So. 2d 511, 513 (Fla. 2d DCA 2007)). "An inference of knowledge and dominion and control may . . . arise where the contraband located in [a] jointly occupied [area] is found in or about other personal property which is shown to be owned or controlled by the defendant." Id. What happens in a Possession of Cocaine Case where the area that drugs were found was Jointly Occupied? However, in this case, the cocaine was found in an area that the evidence reflected had been jointly occupied, and the cocaine was found near personal property which was shown to be owned or controlled by at least three people including Edwards. The victim's identification card was located inside the gray canvas bag, and a bail bond receipt bearing the name of "Joanne A. Simms" was found inside Edwards's wallet. Consequently, under these limited circumstances, we refuse to apply an inference of Edwards's knowledge of the presence of and dominion and control over the cocaine. Cf. Jackson, 995 So. 2d at 540-41 (holding that surrounding circumstances were sufficient for a rational jury to conclude that the drugs contained in a change purse located near the defendant were known to him and were under his dominion and control where the change purse appeared to have spilled from a larger purse, the defendant was known to carry a purse and there were no other purses in the dwelling, the defendant's identification was found inside a cigarette case that also appeared to have spilled from the purse, and there was no evidence in or around the purse or the change purse that they belonged to anyone other than defendant). What does a Florida Court do where there is a defense based upon a jointly occupied vehicle? This court has previously reversed a conviction based on constructive possession where a defendant was in a jointly occupied vehicle and drugs were located near his personal belongings but the items were in an area to which the other passengers had equal access.1 See, e.g., S.B. v. State, 657 So. 2d 1252, 1253 (Fla. 2d DCA 1995) (holding that evidence was not inconsistent with the defendant's theory that someone put marijuana in his bag where the bag was located inside the trunk and the marijuana was found inside another container that was inside the defendant's bag, where multiple people had access to the bag, and where the defendant disclaimed ownership of the container). This is such a case. What do Florida Courts do when there is a Jointly Occupied House? Similar dispositions have occurred where drugs were found concealed near a defendant's personal property inside jointly occupied houses. See, e.g., Bennett, 46 So. 3d at 1183 (holding in relevant part that the State failed to prove constructive possession of drugs found inside a cardboard box where defendant's shirt was found because there was no evidence to prove who owned the other clothes in the box and defendant had a reasonable hypothesis that he threw his shirt on top of the box without knowing that the drugs were inside); N.K.W., Jr. v. State, 788 So. 2d 1036, 1038 (Fla. 2d DCA 2001) (holding evidence was insufficient to establish constructive possession where, although drugs were found in a plastic bag inside defendant's wallet, defendant was never asked if the bag belonged to him, no fingerprints were lifted from the bag, defendant denied ownership of the bag, and multiple people had access to the room where his wallet was located); Evans v. State, 32 So. 3d 188, 189-90 (Fla. 1st DCA 2010) (holding that the State failed to prove constructive possession where drugs were hidden in a pain reliever bottle inside a small toiletry bag, which was itself inside a duffel bag that also contained the defendant's passport, but where no one was in actual possession of the duffel bag at the time of the search, multiple people had access to the room where the bag was found, no fingerprints were found on the duffel bag or pain reliever bottle, and no one was asked about ownership of the pill bottle). The proximity of Edwards's identification to the purple bag in which the cocaine was concealed might be consistent with his having knowledge of the cocaine and dominion and control over it. Yet those facts are equally susceptible to the reasonable hypothesis that the cocaine was in the possession and control of Simms or the victim while they were in the vehicle and that Edwards simply threw his wallet into the gray canvas bag without knowing that the cocaine was inside. See Bennett, 46 So. 3d at 1184. Indeed, there was no evidence presented as to when the cocaine was placed in the purple bag or when the purple bag was placed inside the gray canvas bag. See Evans v. State, 32 So. 3d 188, 191 (Fla. 1st DCA 2010) (noting that presence of the defendant's passport in duffel bag suggests he placed it there, but explaining that "[s]uch an inference . . . provides no time frame with regard to when the contraband came to reside in the bag, nor any help as to appellant's present dominion over the contraband" and, therefore, the "mere presence of the passport" was insufficient to establish defendant's constructive possession). The lack of a time frame for placement of the cocaine in either bag, combined with the lack of evidence regarding ownership of either bag, the lack of fingerprint evidence, and the fact that items belonging to persons other than Edwards were also located in the gray canvas bag lead us to conclude that the State's circumstantial evidence failed to prove that Edwards was in constructive possession of the cocaine.possession of the cocaine.possession of the cocaine. While this case does present circumstances that could be interpreted as incriminating, those circumstances can also be construed as being consistent with Edwards's hypothesis of innocence. What does a Florida Court do where there is a defense based upon a jointly occupied house? We emphasize that it was the combination of these factors that requires us to reverse the judgment in this case. We do not intend for this opinion to be interpreted as requiring reversal whenever drugs are located near a defendant's personal items that are commingled with personal items belonging to someone else. As our case law has made clear, a defendant's knowledge and control of contraband may be inferred where there are incriminating circumstances beyond mere proximity from which a jury could infer those elements. See Jackson, 995 So. 2d at 539.